Before the outbreak of WW1, the War Office was already keeping a close eye on the availability of any likely horse or vehicle which could be used as part of the deployment to meet the needs of the then standing army in the event of a National Emergency. The horses would be needed for the cavalry, infantry officers and for the movement of stores and ammunition. 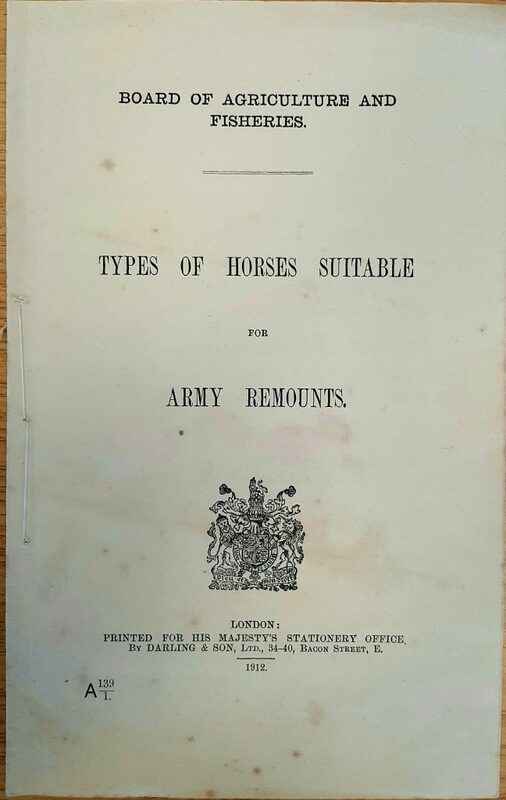 Thus, by 1912 there had been a booklet issued detailing the types of suitable horses to be used by the army as remounts. One such booklet was kept by Mr. Keevil who lived near Melksham, Wiltshire, and believed to be a horse dealer. He kept correspondence between himself and Capt. Kennedy Shaw, Deputy Assistant Remount, Teffont Magna, Wiltshire. But, there is only the communications sent by the Captain to Mr. Keevil lodged at Wiltshire and Swindon History Centre, between 1912 and 1915 and this happened in north to north west Wiltshire. 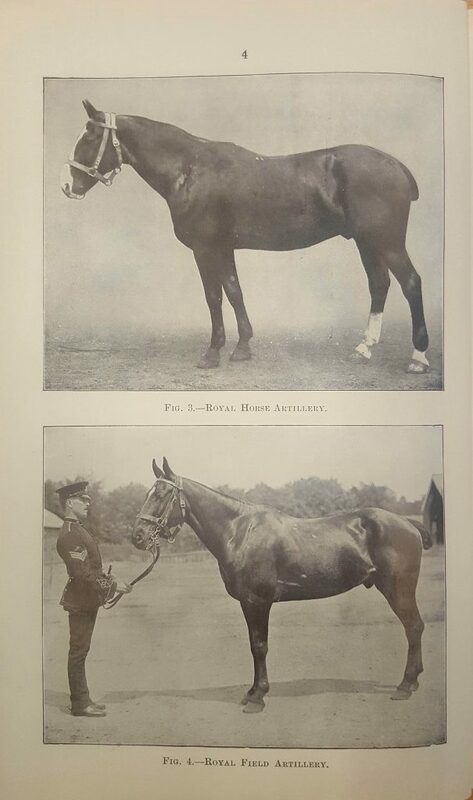 This booklet gives the details of horses using some horsey language and shows some photographs as illustrations of horses the War office may impress should there be a National Emergency. In peace time horses should be 4-7 years old and 6-12 years old during war time. Colour- white or grey for special purposes and always specially ordered. Light or washy colours not accepted. No un manageable, vicious, crib-biters, wind suckers, parrot mouthed, or undershot, no capped elbows, damaged knees, injured or deficient teeth. No droopy lips. Horses with short docks not acceptable by cavalry. No worn out, upright or overshot joints and non with hocks are passed. Need to sound in wind, eye and limb. The Household Cavalry: Need black horses of 4 years 15.3 hands high. At 6 years 16 hands high. Cavalry of the Line: The horse needs deep, short legs, short back, good barrel (of the hunter stamp) light, active and moves easily without brushing of joints. Well ribbed and plenty of bone. Need 1.000 horses. Royal Artillary: Need weight carrying hunter. Able to take it’s place in a gun team in an emergency. At 4 years 15.2 to 16 hands. Royal Engineers and ASC: Draught horses known as “parcel vanners” able to trot with a good load behind. At 4 years 15.2 to15.3 hands. Need 1.360 horses. 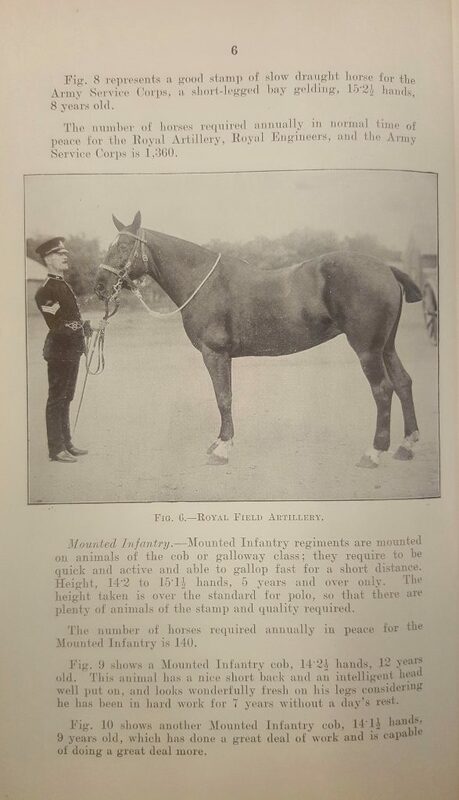 Mounted Infantry: Of the cob or Galloway class. Quick, active and gallop short distances. At 4 years 14.2 to 15.1 hands. May be used in polo. Need 140 horses. By 1913 Mr. Keevil receives more information about the training of horses. It is unknown if he did train horses, but that he supplied them if and when they fitted into the army’s needs. However, he did get this extra bit of information. The 1913 mobilization of horses states that draught horses need no more training but that cavalry horses must pass through training. It was realised by the War Office that both men and horses would need training and sufficient time needed to be allowed. During the past 3 years however, this preparation seems to be vague. The national need during war was 14 Divisions and 14 mounted Brigades of the second line, which took into account the requirement for coast defences and reserve forces. The Expeditionary Force of which 35% was established army with the remainder made up of Territorial Units, of about 1.200 horses exclusive of any privately owned mounts of certain yeomanry. In 1913 it was visualised that 140.000 horses would be need by the army and covering all units. But how could this number of suitable horses be known about and assembled and by whom? Before the outbreak of WW1 it is obvious that the War Office had already started to identify likely horses and their location and also any suitable farm or other types of vehicles, by asking some agents- notably horse dealers to make note of anything the army may have to requisition. 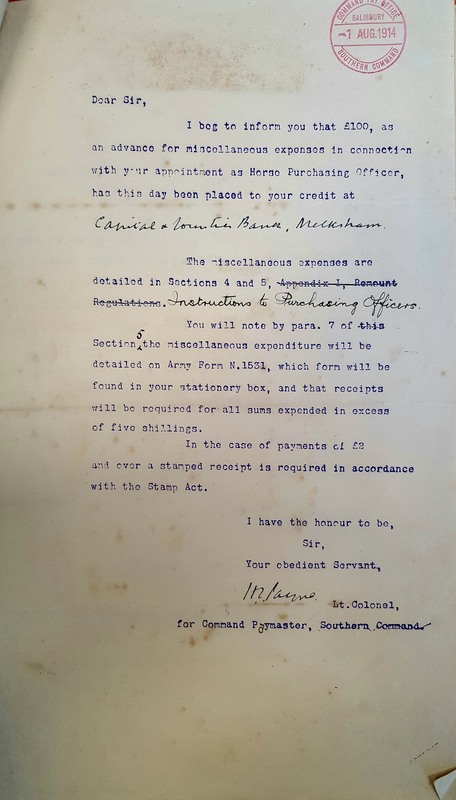 A register needed to be kept and it is possible this would be eventually in the hands of any requisitioning officer. This certainly happened in Wiltshire according to correspondence kept at Wiltshire and Swindon History Centre between Mr. Keevil and Capt. K. Shaw, and may be a National activity also. Mr. Keevil kept a memo dated 1912 which explains how horses could be acquired should there be a National Emergency. It reiterates the Army Annual Act 1911 and says the King would declare a National Emergency and in the case of horses and vehicles needed for Service (and already noted in the unofficial survey in peacetime) these needs were to be promptly impressed according to section 114 of the Army Act and collected and issued to troops needing them. Hence the need for a register. Counties were divided into areas and controlled by authorized officers who had the power to enter private stables between 6 am and 9 pm to see what horses or vehicles suitable for military use were contained there. Entry unto private property and with authority of the owner, but if permission is refused the Deputy Assistant Director of Remounts, Capt. Kennedy Shaw, Teffont. Would call to explain the urgency. Failing co-operation from the owner a search warrant provided by a Justice directing a constable to accompany the officer to the premises. Care needed to be taken not to deprive the owner of all their animals. This is the situation in 1913 and although the above refers to Wiltshire it could also be repeated throughout the United Kingdom. Correspondence from the man signing himself as Shaw- Remount Teffont is kept by Mr. Keevil for several years. In the early days the typed letters are ponderous such as the time when it took 4 months to resolve the matter of a branding iron, needed by Mr. Keevil from Tidworth being too long to be sent through the post. But, during 1914 there seems to be more communication and as time wore on letters were replaced by telegrammes. On 31st July 1914 Mr. Keevil is told “ immediate purchasing of horses to be done on receipt of this telegramme and to waive the 10 mile radius to a collecting point. Pay fees for horses- no quibbling and direct horses to railway stations. Police and Railway companies notified”. Capt. Shaw sent a telegramme saying from noon today (3rd August) you can commence draw pay for horses. Mr. Keevil, had already been sent another army cheque book in May because the “army thinks they have underestimated the number of horses they will need” £100 had already been deposited at Capital and Counties Bank, Melksham. He will need to mention N 1531 for the relevant forms to be filled in and also the need for receipts for over 5/- and any receipt over £2 will need a stamp as per Stamp Act. The army had earlier stressed the need for a deputy whom Mr. Keevil trusted to hold purchasing papers and how to contact the army approved vetinary surgeon. 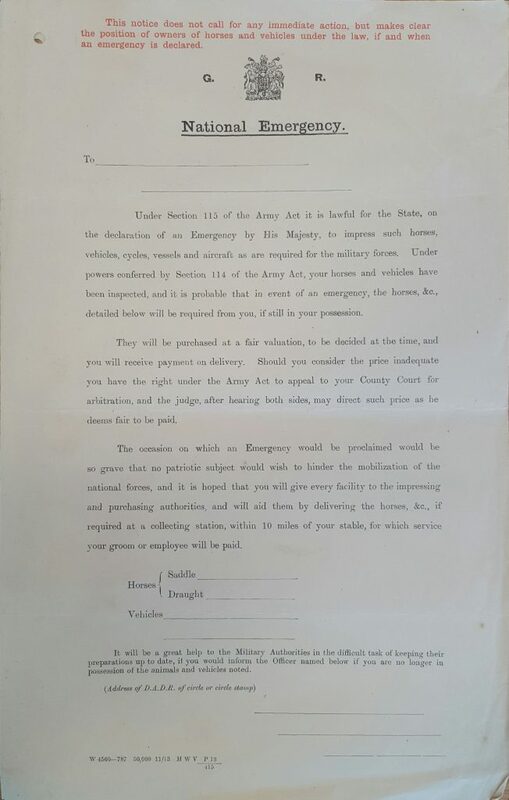 When the time arrived for horses to be sent to units needing them the army expected six horses to be handled by one rider even if the horses were to travel by train, and the rider have a return third class ticket. The vet. 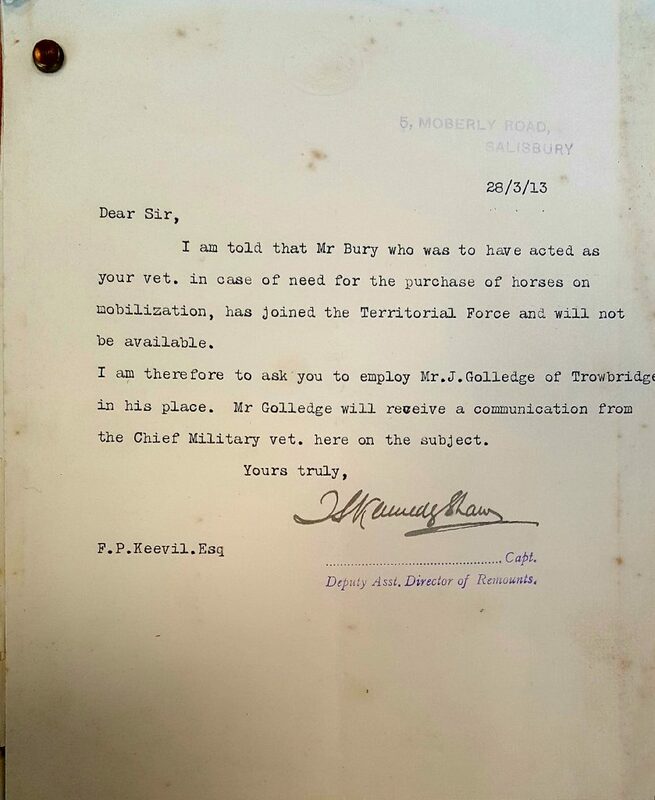 In question was Mr. J. Golledge of Trowbridge who would need to travel to Melksham to visit Mr. Keevil’s farm and we have no idea how he managed to get to the farm. The end of the correspondence is in sight and there is no more saved communication between these two men. There is a memo from Mr. Keevil which says he did send 44 horses to the reserve park, Portsmouth including some from the Co-op, Church Street, Melksham and Stratton and Son, High Street, Melksham and that he had to use civilian labour and entrained the horses at 6 pm, Melksham the day of mobilisation. Some horses must have been beauties because a note dated 14 August 1914 when he sent 45 horses to 4th Wiltshire Yeomanery, Warminster with a bill being: 31 horses £1.238/10 plus 10 horses in total with above bill £1.704, and 1 horse included in the above bill £1.772. There is no word where the remaining 3 horses are! The above mentioned documents can be found at Wiltshire and Swindon History Centre, Cocklebury Road, Chippenham, Wiltshire. Archive Ref: 2689/1. 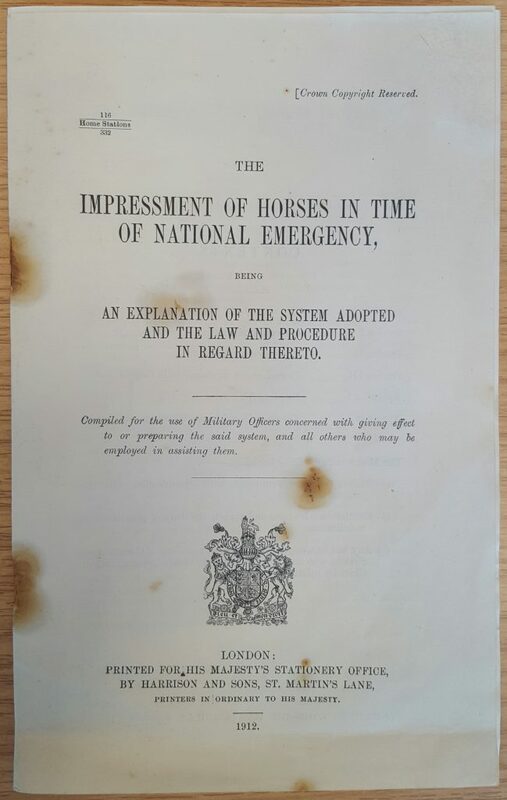 ‘The Impressment of Horses in Time of National Emergency’ booklet, published in 1912, sets out the law regarding the rights of government to requisition horses needed for the war effort.